Fab Lab is equipped with a wide variety of machine tools from digital to analog, it is an experimental public workshop of the network. Expanding the possibility of free Manufacturing by individuals, we aim to foster a “what their uses and the people themselves use is making culture”. Authentication systems, such as issuing a use permit for the name of the Fab Lab does not have at the moment but, Fab Foundation has cited four of the following as a condition for using the name of the Fab Lab. In addition, the contents of which have been continuously discussed in the world Fab Lab conference. Fab Lab opens the machine tool for personal creation and invention, we are working and trying to democratize manufacturing. Therefore, the original exchange conditions change in free or monetary, and it is required that is exposed is generally at least once a week. Fab Charter is what Fab Lab of the world is a summary of the basic principles and operational guidelines to be shared. Facility claiming the Fab Lab is to post this content to a location touching the eye of the web site within the facility, it has been required to be well-known to the user. All of the Fab Lab is, to share the know-how and design data of manufacturing, so forward to once again duplicate and improvement, we are sharing the equipment. Digital / analog combination of various machine tools and hand tools, (almost) with the aim of environment that allows you to create everything (except those that hurt the people are excluded). Therefore, It does not mean that Fab Lab if they have a laser cutter and 3D printer, does not also essential various hand tools and electronic work tools other than digital equipment. Laser cutter: paper and wood, cut the wood, such as acrylic, engraving. CNC router: a plate of wood by cutting, large routers for making furniture. Milling machine: wood, high-precision milling machine for cutting resin, metal or the like. It is also possible to make the circuit board by cutting the copper plate. Paper / plastic cutter: cut out the paper and cutting sheet. Make a mask or a flexible circuit. 3D printer: on the basis of the 3D data, and outputs a such as a resin as a three-dimensional. Various hand tools and electronic work tools: file to finish the processed products, screws and drivers for mechanical assembly, such as a soldering iron and an oscilloscope for electronic circuit. Is held every year and “World Fab Lab conference”, cooperation projects such as a work shop cross-border, to participate in international Fab Lab of the network such as through video conferencing system, you will be prompted to share to open its activities. By cooperation and share issues, such as know-how and lab management of manufacturing, creating a value that can not be obtained by the individual of the lab alone. This network is what is one of the important features for the Fab Lab, facility to work independently without any other lab and the contact is not a Fab Lab. 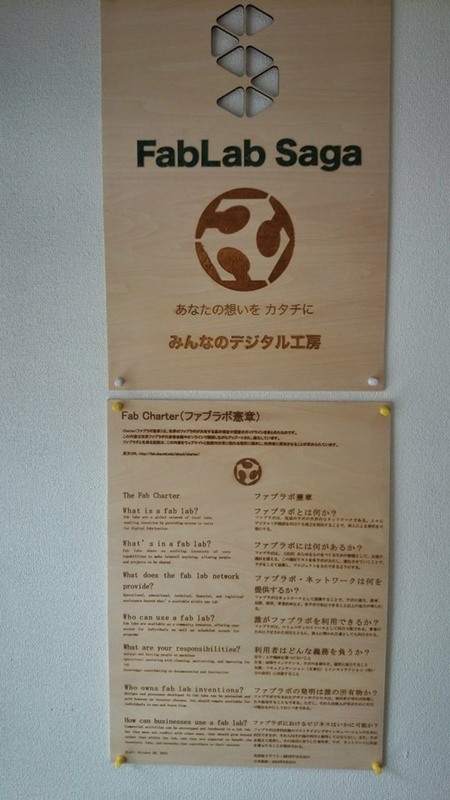 Fab Charter is what Fab Lab of the world is a summary of the basic principles and operational guidelines to be shared. This content is Apputo while discussion in the world Fab Lab representative conference and online, has evolved. Facility claiming the Fab Lab is to post this content to a location touching the eye of the web site within the facility, it has been required to be well-known to the user.